The first day at school. Going | What's a daddy for? There’s no sky today. Just a creamy grey void where it should be. Without definition. The rain’s coming down, steady as a prison sentence. My son and mummy were awake before me. Already about their business now. I move to the stairs and see him coming up to find me. We meet in the middle, like the Grand Old Duke of York, I tell him. We sit there on the stair. Just like that. He’s on my knee and I’m holding him in my arms. Neither of us speaking. No need to. We sit there. Just like that. I don’t think any of us slept very well last night. He ended up in our bed again, stretched out horizontally like a barrier between me and mummy. Feet at her end. Head at mine. I had unquiet dreams. Of being late on the first day. A friend had told me that the entrance gate closes at a certain minute, and if you don’t make it you have to go in through the front door, past the principal’s office to be marked as late. This is my dream from last night, except in it it’s me who’s late. We move from the stairs at last. I make the breakfast, cereal and a smoothie. I go to feed him but he takes the spoon and sends me away, slightly chastised. He eats everything. I can tell he’s a little afraid but he wants me to know he’s being brave. I ask him if he’s nervous and he gives the smallest nod I’ve seen. I hold his hand and we watch some TV. I ask him if he wants me to dress him but he prefers mummy. That bond is just a little deeper. The first tears come as the blue jumper is pulled over his head. The tiny grey shorts with a fierce crease. He’s mumbling something soft and I have to strain to hear. Mummy talks to him. Tells him how brave he is. How proud we are of him. How it’s natural to be a little afraid on the first day. It’s ok so far. Nothing worse than we expected. Just a couple of scratches, no scars. I make a little snack. The challenge of finding something healthy he will actually eat. I settle on a pancake and some raisins. I put the plastic lunchbox in his brightly coloured new schoolbag. There are a few more tears as we put his shoes on. But when we produce our cameras to take photos for the grandparents a performer’s smile is worn. This troubles me a little. It reminds me of my own capacity to make other people think exactly what I want them to. How I kept the real stuff packed tight inside. 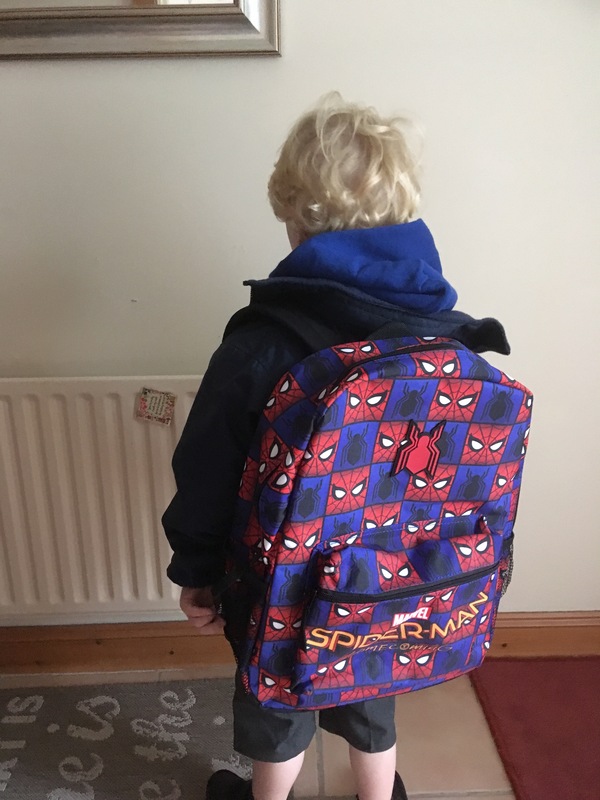 The school raincoat is needed and the schoolbag is hoisted onto his shoulders. It’s so large that it seems faintly ridiculous, giving him the appearance of a snail carrying his home on his back. I have everyone in the car much too early. I’m worried about the traffic and keep thinking about being late and having to walk past the headmaster’s office. But it’s not that bad. I get parked right outside the school with time to spare. He walks slowly through the playground, holding both mummy’s and my hand, a little cowed by the presence of older and noisier children. But we see some of his friends and his face brightens a little. I know he’s doing everything he can to be brave for us, and it’s pulling me to bits. The headmaster opens the gates and we move to his classroom. Every child has their own manner. Some rush inside, barely looking back at the tearful parent, while others need that little bit more care. Mummy takes him inside and to his desk. I want to go to but decide to hang back. Two parents inside seems excessive. Staying back seems even harder though. My face is against the window. He’s fine. While mummy’s with him. Some of his friends from nursery come to play with him and I see signs of animation and excitement in his face. Some other parents are in the classroom too. I see one little girl who has her arm around her mother’s neck, closer to a wrestling hold than a child’s gesture of love. Soon the teacher shuts the door and mummy is gently ushered out. The poor teacher has to deal with the little children and the big children. I can see my boy is crying now. I knew he would. But the teacher’s there to comfort him and so are his friends. It’s ok. There’s no real distress. No sense of horror. We retreat to a nearby coffee shop and meet with some other parents. It’s almost like the aftermath of a funeral as we swap tales and anecdotes. Some back humour about the tears. And then we’re home again. With nothing really to do but wait until we pick him up. Mummy distracts herself with some cleaning. I write. We wonder what he’s doing now. It’s a funny sort of in between time. We’re neither up nor down. We’ll find out soon enough. That’s the first morning done. Oh in floods here reading this. I really hope he has the best day. Hoping you and mummy bear are ok.